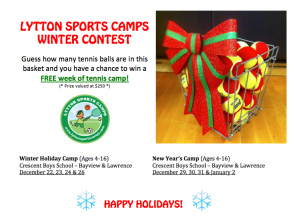 Home : Blog : Have a ball, and win a free week of camp! Have a ball, and win a free week of camp! If you’re in Toronto, and looking for some fun activity for your kids over the holidays, click on the picture and take a guess at how many tennis balls are in this basket. Leave your guess, your name and email in the comments below. The person who guesses the closest number wins a free week at the Lytton Sports camp. Contest closes December 12th. Thank you to everyone who participated. The correct number of balls is 65, so the winner of the contest is Cathy Thomas who guessed the closest at 48! Congratulations, Cathy! Congratulations, Cathy! Your guess was closest to the actual number (65) so you’re the winner!